Separate microwave, electric kettle, American coffee machine and Bialetti Moka express. Free satellite Wi-Fi access on both floors. External timber dining table and benches with parasol, outside ground floor on the gravel terrace. A further outside table and chairs is on a paved patio area outside the first floor. There are also several lounging and sunbathing chairs. A wood-fired oven is at guests’ disposal in a quaint little building in the main garden of the house. This traditional stone oven is perfect for cooking everything from artisan bread to meat and vegetables stews. On the ground floor of the house there is a utility room with washing machine and large sink, iron and ironing board. All bed linen and towels (for use in the house) are provided. At guest's disposal there's a Skype phone with credit and a satellite flat screen television. 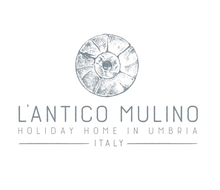 L'Antico Mulino is a pet friendly holiday home. There will only be an 18 Euros charge per animal for extra final cleaning.